You will find, in the two e-volumes of Guru Rattana's Introduction to Kundalini Yoga and Meditation, everything you need to begin your voyage of self-discovery into the magic of Kundalini Yoga. Volume 1 provides a thorough understanding of the basics. 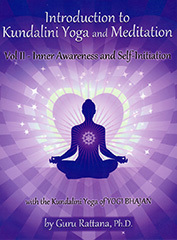 This second volume - Inner Awareness and Self-Initiation - takes you much deeper into the technology. From its enlightening exploration of the Ten Bodies and Chakras systems you will gain a lucid understanding of the physical, mental, emotional, and subtle energic aspects of the awakening process, as you discover how to evolve from ego to soul consciousness.